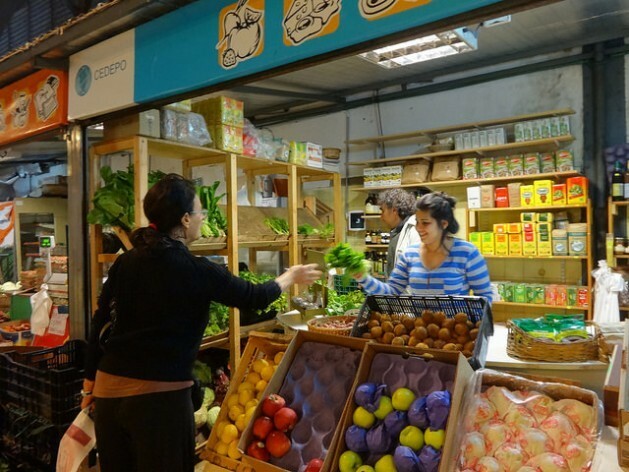 BUENOS AIRES, Aug 13 2015 (IPS) - It’s pouring rain in the capital of Argentina, but customers haven’t stayed away from the Bonpland Solidarity Economy Market, where family farmers sell their produce. The government has now decided to give them a label to identify and strengthen this important segment of the economy: small farmers. Norma Araujo, her husband and son are late getting to the market in the Buenos Aires neighbourhood of Palermo Hollywood because the heavy rains made it difficult to navigate the dirt roads to their farm, in the municipality of Florencio Varela, 38 km from the capital. They quickly set up their fruit and vegetable stand as the first customers reach the old warehouse, which was closed down as a market during the severe economic crisis that broke out in late 2001. Today, 25 stands offer products sold by social, indigenous and peasant organisations, which are produced without slave labour and under the rules of fair trade. “Our vegetables are completely natural. They are grown without toxic agrochemicals,” Araujo told IPS. She is a member of the Florencio Varela Family Farmers Cooperative, which also sells chicken, eggs, suckling pig and rabbit. Across from Araujo’s stand, Analía Alvarado sells honey, homemade jams, cheese, seeds with nutritional properties, natural juices, olive oil, whole grain bread, organic yerba mate – a traditional caffeinated herbal brew – and dairy products. Argentina’s new label forms part of a collective effort by the Mercosur (Southern Common Market) which began to work with such labels four years ago, as part of the Specialised Meeting on Family Agriculture (REAF), Raimundo Laugero explained. Brazil – a member of Mercosur along with Argentina, Paraguay, Uruguay and Venezuela – was a pioneer in the bloc, creating a family farming label in 2009, according to the REAF. “The idea is to give small farmers a chance, and here we have people from all around the country, who wouldn’t otherwise have the possibility of selling their goods,” Alvarado said. “A label identifying products grown on family farms not only makes the sector more visible but foments a dialogue between consumers and farmers who have a presence in the countryside across the entire nation, generating territorial sovereignty,” said Raimundo Laugero, director of programmes and projects in the ministry’s family agriculture secretariat. In the category of family farmers the government includes peasants, small farmers, smallholders, indigenous communities, small-scale fisher families, landless rural workers, sharecroppers, craftspeople, and urban and periurban producers. In his interview with IPS, Laugero said the label will not only identify products as coming from the family agriculture sector, but will “guarantee health controls, chemical-free and non-industrial production, and production characterised by diversity, unlike monoculture farming. “When we’re talking about a product from family agriculture, the symbolic value is that they are produced through artisanal processes and with work by the family, and one fundamental aspect is that behind the product are the faces of people who live in the countryside,” he said. Agriculture is one of the pillars of the economy of this South American nation, accounting for 13 percent of GDP, 55.8 percent of exports and 35.6 percent of direct and indirect employment. She also shops here because of “a social question” – she wants to benefit those “who produce natural food without so much industrialisation, while avoiding the middlemen who drive up food prices. Otero said the new label was “great.” “There’s a lot of deception in this also, from people who say they’re selling organic products or products made with a social conscience, and it’s a lie. This label gives you a guarantee,” she said. “This will especially help the public become aware of what it means to help small farmers. So they can realise that what they pay and what they consume really goes to them, and for the people who do the work to really get paid what they are due,” Alvarado said. He pointed out that normally when farmers apply for a label recognising their products, they need to turn to a company that carries out the certification process, while the concept “agroecological” has other components. He mentioned six pilot projects in Argentina, of participatory guarantee systems – basically locally focused quality assurance systems – for agroecological products, which involve organised farmers and consumers, and which the state will now support as well. “With the label, they’re going to do much better, because they’ll have a more massive reach, and more people will be included,” he said. At the Bonpland market, Claudia Giorgi, a member of the La Asamblearia cooperative, which works as part of a network with other social organisations, is preparing shipments to another province which will use the same transportation to send products back, to cut costs. Giorgi makes papaya preserves. But she also sells products from other cooperatives like natural cosmetics, lavender soap, medicinal herbs, pesticide-free tea, mustard and different kinds of flour. “What is produced in each social organisation is traded for products from other groups, at each organisation’s cost, which is the producers’ costs plus what is spent on logistics,” she explained to IPS. Laugero noted that besides accounting for 20 percent of agricultural GDP, family farming represents 95 percent of goat production, 22 percent of cattle production, 30 percent of sheep production, 33 percent of honey production, 25 percent of fruit production, 60 percent of fresh vegetables, and 15 percent of grains. In her case, Araujo puts the emphasis on solving even more simple problems, such as finding transportation for her vegetables to the market, even when it rains. “They should fix our dirt roads,” she said, clarifying that small farmers themselves have offered to participate in the task.